Why stay in a hotel when you can stay in a furnished rental instead? Hotels and motels are designed for people who are traveling and need a temporary place to stay. There are different types which vary in cost and quality, all handling basic needs. Included in the room is a bed(s), dresser, TV, seating area, desk and bathroom. The space is very tight and can get uncomfortable after a few days and visitors often end up feeling claustrophobic. Toronto serviced apartments, on the other hand, offer more for their guests. They are spacious impermanent places to stay at, offering more than you would get in a hotel at a comparable rate. For instance, furnished condo rentals allow you access to the buildings amenities, which usually consist of a pool, sauna/spa, fitness facilities, and BBQ areas. Some even have billiards/games rooms, yoga studios, party rooms, massage rooms and more. The units themselves are larger and have fully functioning kitchens with everything you need from a spatula to tea towels. Most of the times there are dining areas and a living room, as well as beautiful modernized bathrooms. Also, some suites come with a den; these are perfect for business people seeking Toronto corporate housing. Another exciting reason why staying in a furnished rental is better than hotels is the ambiance. The lighting and furniture in hotel rooms can be drab and gloomy. Unlike furnished rentals which are frequently decorated by an interior designer. The furniture is thoughtfully selected with the prospective company in mind. Cozy couches and contemporary finishes add a nice touch, and allow you to feel at home. So, what happens to your clothes when you stay at a hotel? That’s right; the laundry piles up or has to be sent out to the cleaners. Not in Toronto furnished short term rentals because there are a washer and dryer combo in each unit. You can wash your own clothing. And what about the linens you ask? Well, a cleaning service will come in regularly and clean the sheets and towels for you! Ever been to a hotel that makes you pay for internet use? Well guess what, when you stay at a furnished apartment, WIFI is included with your stay. No more leaving the comfort of your room to go to the lobby just to check your email. 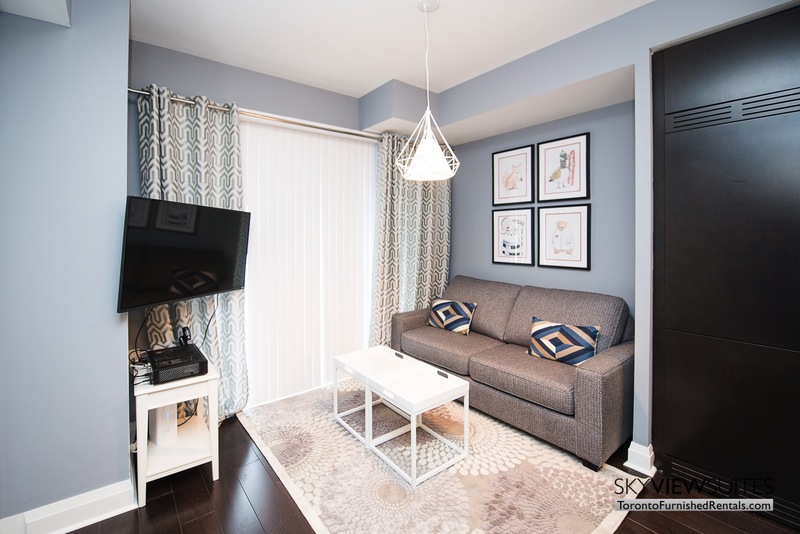 When it comes to Toronto accommodations SkyViewSuites does it better than the rest. Check out our available units at www.torontofurnishedrentals.com.